Adobe Lightroom is a new type of photo application, combining image editing with image management for keeping track of photos. It's more efficient than using two different programs. Lightroom uses 'non-destructive' editing, saving adjustments within the image library rather than modifying the original. You can go back at any time and change things or create a Virtual Copy, which you can apply a different set of adjustments to. You can save photos in albums, create slideshows and web galleries and print images too. The RAW conversion tools are excellent, with a Highlight Recovery slider and a Fill Light slider which adjust highlights and shadows separately. The Auto Tone option is especially smart, producing super-bright, clean-looking RAW conversions. Lightroom is very good at maximising the dynamic range of your photos. It's so good at this, though, you might overlook a side-effect, which is a general loss of mid-tone contrast and saturation. The extent of this will depend on how much correction the software's had to make, but you can find that achieving the maximum dynamic range has also knocked a lot of the 'life' out of the photo. 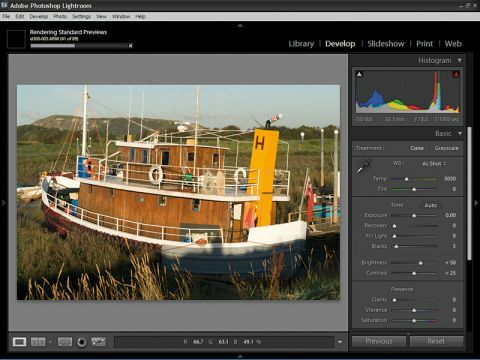 Lightroom's RAW conversions are the same as Photoshop's and Elements'. Generally very good, but there can be a lot of noise in blue skies. It's not necessarily the sharpest converter, though the colour fringing controls are good. Lightroom is good, make no mistake, but its RAW conversions aren't always the best and it needs a pretty fast computer to run efficiently.